Fall is definitely in the air here in New England. The trees are already amazing, it has been raining/misting almost every day, and I'm totally in the mood for warm comfort food! I tried this new recipe tonight and it was a home run! I learned a few things I'll do differently next time (shared below) but overall, it was a definite success! Maybe I'll get it just right so I can post a perfect picture of it next time, but for now... you get the less pretty, real deal! I made half the recipe and put it in a 9x9 baking dish, which worked pretty well and made about 4 servings. Let me know what you think! 2. Lightly grease a large (deep) baking dish, or 6, 6-in. pie pans if you have them. 3. Combine all the crust ingredients in a food processor and pulse to combine until dough will hold together when squeezed in your hand. 4. Transfer dough to counter top or into a large bowl and knead gently into a dough. Dough will be smooth, add additional water or tapioca as needed. 5. Chill dough in the fridge for 15-30 minutes (don't skip this step!). 7. Add chicken and gravy to vegetables, stir well to combine, remove from heat and set aside. 8. Divide the crust dough into 2 portions. 9. Roll 1 portion (in-between layers of wax paper) into a large circle and gently press into the bottom of the baking dish. 10. Add the filing mixture to the baking dish. 12. 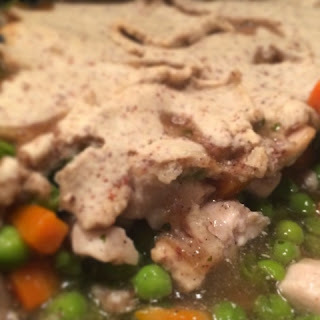 Place pot pie on a cookie sheet and bake at 350 for 30-45 minutes. Let it cool a bit and then devour with a big smile on your face!